One of the most amazing experiences at Disneyland! 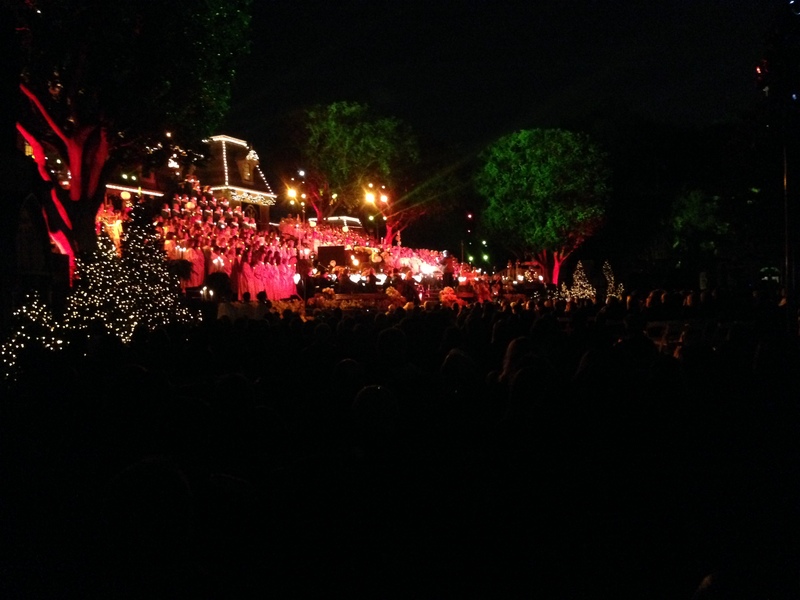 A holiday tradition since 1958, this retelling of the birth of Jesus with classic hymns and a huge chorus of singers is one of the most beautiful and jaw-dropping experiences in the park. Narrated by celebrities on the par of Cary Grant, John Wayne, Jimmy Stewart, and James Earl Jones, it is wonderful to both see and hear. As the carolers come down Main Street USA, they fill the train station steps at the front of the park and the all-volunteer Cast Member choir forms the living Christmas Tree in the center. It truly is something everyone should see at least once. As it has in the past, Disneyland continues it’s traditional one weekend / two shows per night schedule. This year the show is being performed on December 2nd and 3rd. Readers haven’t been announced, but they always choose someone who delivers the story with emotional power so no matter who you get it’s worth it. The last time I went was when Blair Underwood read the Christmas story and his deep, sonorous voice was rich in tone. I would love to have seen Ginnifer Goodwin who did it last year or Lana Parilla in 2015, being a huge Once Upon A Time fan! If you decide to go, you’ll have a wonderful time. But be prepared! Hopefully these tips will help you make the most of your Candlelight Procession experience. Tip #1: Get there early. While you may not need to wait 10 hours like a few truly intense people did, to get a good view you certainly will have to wait a while. Perhaps stake out a spot before the afternoon parade and simply don’t move afterward. Tip #2: Make sure the spot you are holding onto will be a place you can stay during the performance. Because it is not the same as a parade, the traffic flow in and around the train station follows a different pattern. It took a lot of asking because not every Cast Member had information about what areas were safe to watch from, but do ask around. 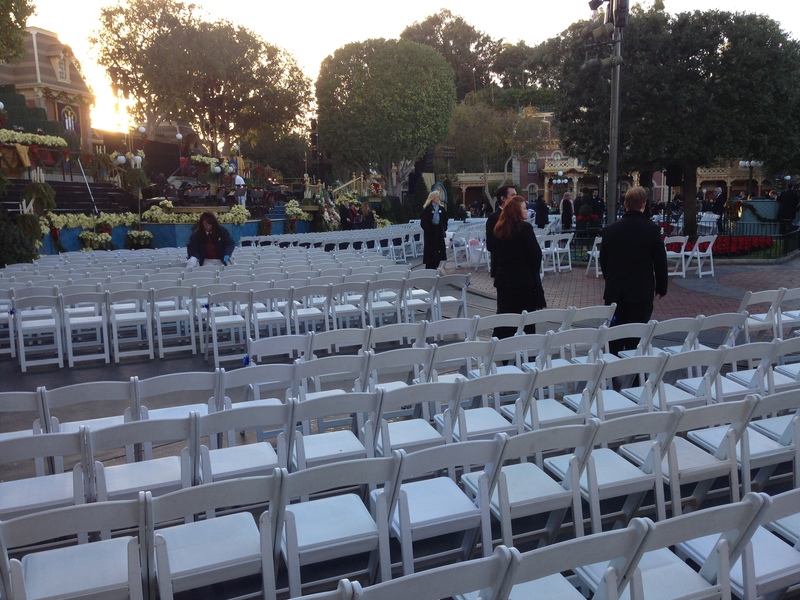 Cast members began showing up for guest control about three hours in advance of the event. Tip #3: Bring a friend with you. Because it does involve waiting for such a long period, unless you are skilled at not going to the bathroom, you will need to switch off with someone. Plus, it would be handy to have a friend go and get snacks while you are waiting or vice versa. 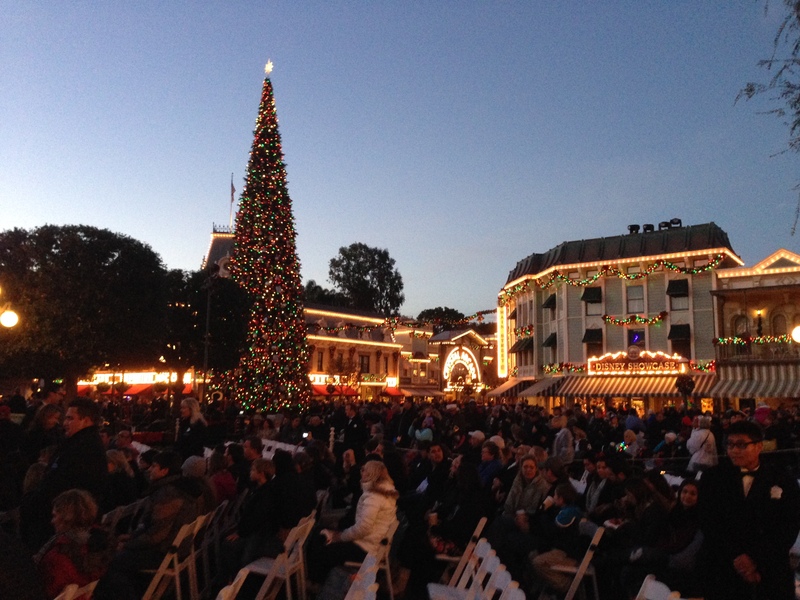 Tip #4: If using a wheelchair or ECV, there is a place for you to watch from, but it gets packed early, too. I’m not sure if you are limited to the number of people who can watch with you from that area. Would be good to check before you stake out a spot. Since that area got opened after the other areas, it might be good to stake out a regular spot first just in case. Tip #5: Make sure your whole party is there at least an hour before the show. That’s when it starts getting crowded and if you’re in the front, you may not be able to “hold a spot” for family and friends past this point. People are asked to stand and holes get filled in very quickly. If you simply want to see the show, you can. Long waits are not necessary. I’ve had friends who walked up at the last minute (especially for the second show) and were able to see and hear perfectly well. But if you want to guarantee a great view these tips should be really helpful. Believe me, if you can go it’s completely worth it. I still think I even had a better seat than the people in the chairs who were pretty squished in there. After the seating time was over, any left over seats were open to all of us waiting. My spot was so good, I declined a seat. Hope you get a good spot too and Merry Christmas!